Mineral insulated thermocouples are widely used for temperature measurement in many applications. 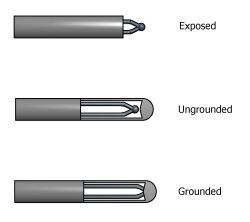 To their essential characteristics (sensing element, insulation, protecting sheath and connection) those thermocouples add unique properties such as bending possibilities (to suit any environment) and a wide range of dimensions (from miniaturization to great lengths). The connecting head allows a reliable and replaceable connection through a terminal block or a transmitter. This type of connection is much used in process industries. Operational and environment temperatures are the 2 main criteria for selecting the diameter and material of the mineral sheath. Compact mineral insulation (magnesium oxide) allows perfect insulation of the wires whichever shape is given to the thermocouple. Reduced tolerances are available on request. Whenever requested by specific applications, other applicable standards are also complied with. Mineral insulated thermocouples may be used in potentially explosive atmospheres provided that the requirements of the 94/9/CE European Directive and our EC-type examination certificate are complied with. More information.